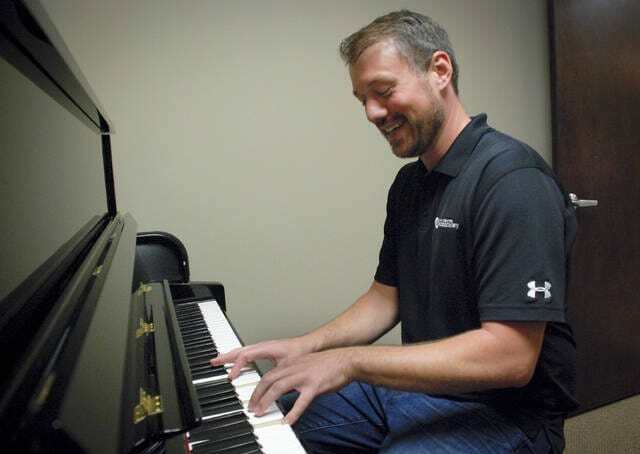 Chad Ebert said he has been doing what he loves since he was about 15 years old, playing and teaching music. Ebert is the director and founder of the Powell Academy of Music and now the Lewis Center Music Academy. When he gets a moment he sneaks away to one of the music rooms of the school to play a little jazz on the piano. “We’ll have 100 students by the grand opening Aug. 26,” said Chad Ebert, director and founder of the Lewis Center Music Academy. Ebert said people will just walk in from off the street asking about music lessons at the Olentangy Crossing Plaza location, 6433 Pullman Drive. He said the academy has enrolled over 70 students since opening June 5. The Lewis Center location is Ebert’s second music school. He said he has been at his first location, Powell Academy of Music, for nine years and has 600 students enrolled with a waiting list of about 100. Ebert said he started the school with a few music friends. The school’s focus, Ebert said, isn’t to teach the trendy guitar riffs of AC/DC or Metallica. He said the goal is to foster a student’s creativity, confidence, and grit. Many of Ebert’s students have gone on to receive college scholarships or recording deals. “One student, Sarah Clapper, won Miss Ohio 2017 and will be in the Miss America contest,” he said. Clapper plays the piano and was crowned Miss Ohio on June 17. “Besides, if I had to teach Metallica riffs seven days a week, I don’t think I could do this anymore,” Ebert added. Ebert said he spends most of the week at the Lewis Center school and one day a week at the Powell location. He said good employees make it possible for him to focus more on the new school. “My office staff at the Powell school are awesome,” Ebert said. Ebert plays jazz piano and said he has been teaching music since he was about 15-years-old in his parents home. He said he comes from a musical family and that he is doing something he loves, playing and teaching music. “That’s my son,” he said, pointing to a picture of a young man playing drums. Ebert grew up in the Polaris area and attended the old Olentangy High School. Ebert’s new school is within walking distance of Olentangy High School, providing easy access for students and saving parents from driving to Westerville, Powell, or Delaware for their children’s music lessons. The school offers classes for students as young as a month old to adult with private lessons in, piano, guitar, voice, violin, viola, flute, clarinet, saxophone, trumpet, drums, and more. For information, call 740-913-1718 or stop in after shopping at Kroger. This entry was tagged Chad Ebert, Delaware Ohio, lewis center, Lewis Center Music Academy, Powell Academy of Music. Bookmark the permalink.